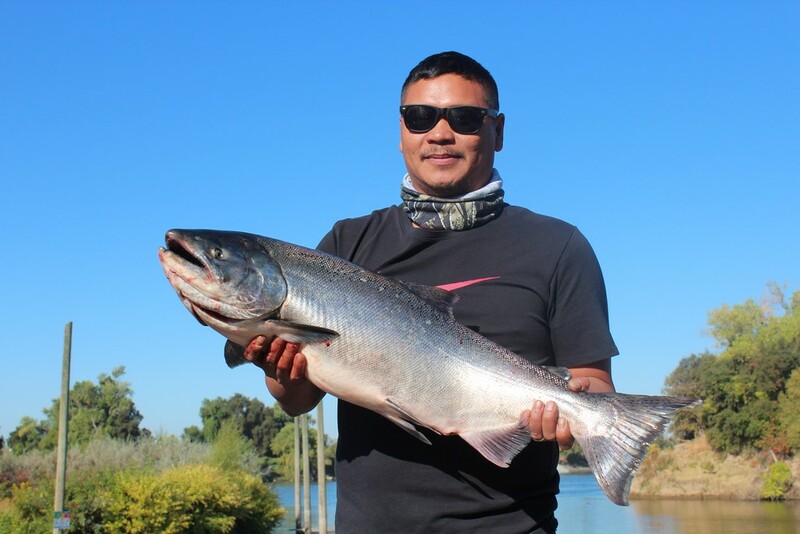 Anglers are seeing greatly improved fishing in the stretch of the Sacramento River from Pittsburg to the Sacramento metropolitan area this year as the fall run of Chinook salmon moves upriver to spawn. 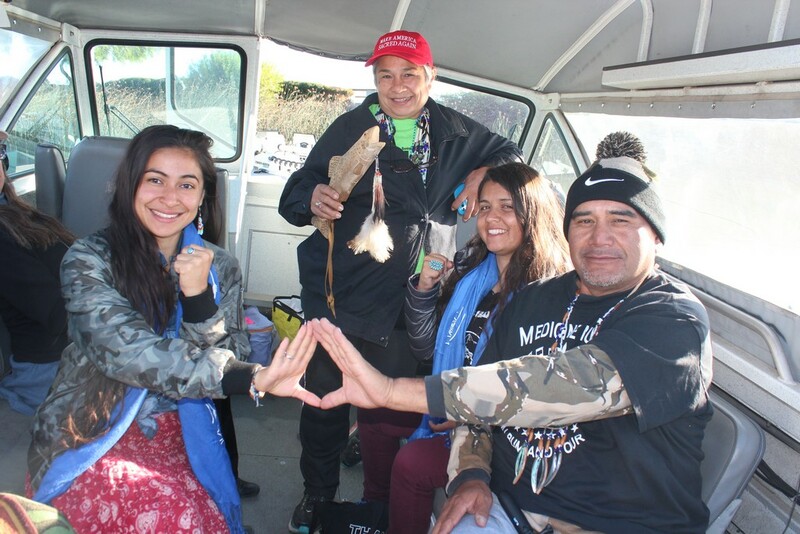 In the short time that I was waiting at Discovery Park for participants in the Winnemem Wintu’s Run4Salmon to board the boat making the journey from Sacramento to Colusa on the morning of September 22, anglers in two boats arrived back at the dock with their one fish limits of salmon. For example, Larry Mabalot, Benny Tayag and Oliver Pascual came in with three bright salmon up to 18 pounds. They landed their fish while trolling with Kwikfish and Silvertron spinners around the I Street Bridge. 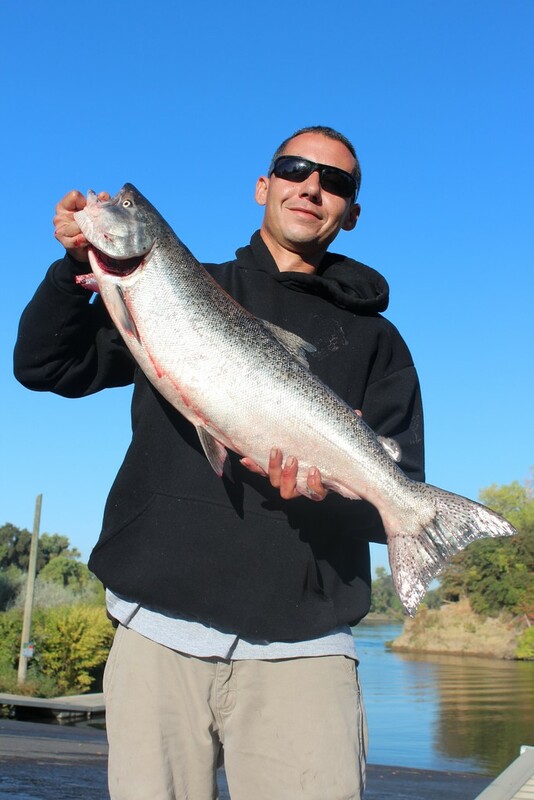 Mike Morales of Sacramento returned to the ramp with his one salmon. “I caught the fish while using a jig,” he explained. While the salmon fishing on the Sacramento River has been much better than expected, the salmon are still in deep trouble. 2017 was the third year that the Sacramento River fall run didn’t meet its conservation goal of 122,000 to 180,000 fish set by the Pacific Fishery Management Council, prompting the designation of the fishery as “overfished,” even though it was water exports, diversions, dams, habitat destruction, and poor federal and state water management over the decades that have led to the collapse. Meanwhile, low numbers of winter and spring run Chinook salmon continue to return to the Sacramento River and its tributaries. To help restore native winter run Chinook salmon back to the McCloud River, Captain James Netzel of Tight Lines Guide Service and Alyx and Brennen Howell of Santa Rosa, both members of the Wappo Tribe, donated their services this September to take leaders of the Winnemem Wintu Tribe and their allies in jet boats on the Run4Salmon. 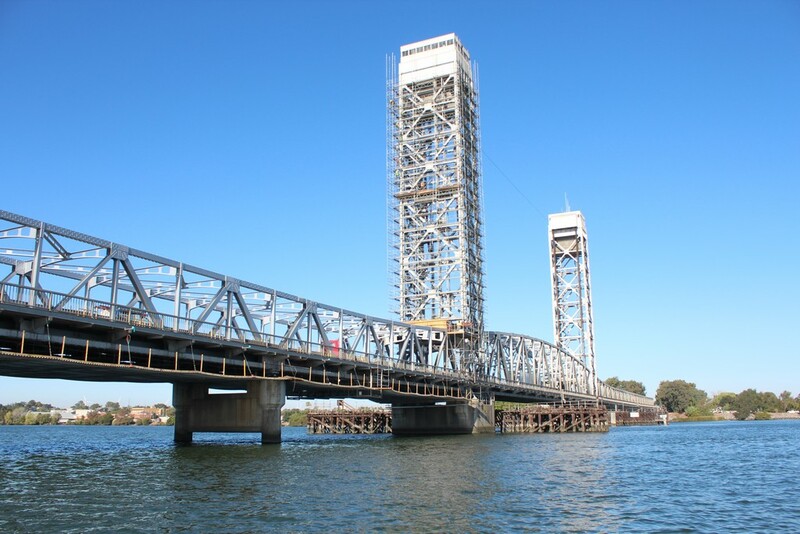 Netzel drove the Pittsburg to Sacramento stretch of the river in his boat on September 18 while Alex and his brother boated the section from Sacramento to Colusa section on September 22. This was the third year of the Run4Salmon. Different sections of the run featured running, walking, boating and bicycling and ended with a paddle in dugout canoes up Shasta Lake and the McCloud River arm, as well as a horseback ride to a village site where the tribe conducted a ceremony. The run for salmon traces the route of winter run Chinook salmon from the estuary at Vallejo all of the way to the McCloud River where it enters Lake Shasta. The tribe is trying to reintroduce the original run of McCloud winter run Chinooks, now thriving on the Rakaira River in New Zealand, where they were introduced over a hundred of years ago, back to their ancestral home on the McCloud. The tribe set up a Go Fund Me site to raise money to conduct DNA Testing of the Rakaira River salmon. During our section of the trip, we passed many fishing boats on the way, but also saw evidence of some of the many threats posed to the river and its fish. Gary Thomas, a Pomo Roundhouse leader from Lake County, pointed out the natural gas wells that line the river and the many pipelines that cross the river, posing a threat to the river and the environment, particularly in the Pittsburg to Rio Vista section of the river. We also boated by the Delta Cross Channel that diverts water from the Sacramento River to the Mokelumne and San Joaquin rivers. We also took videos and photos of The Southport Levee Improvement Project, one of four designed to bring West Sacramento up to the state-mandated 200-year level of flood protection. Caleen Sisk, Chief of the Winnemem Wintu Tribe, said UC Davis now has the DNA collected from 100 samples their tribe and other tribes collected on the Rakaira River in New Zealand this summer. The samples are now at UC Davis, where they are being tested by Dr. Michael Miller. After the salmon are certified as the original winter run, then the Tribe will have to fight for passage on the Sacramento to the McCloud above Shasta Dam. “Getting the fish around the dam is cheaper than truck and haul. The tribe wants to provide for fish passage by connecting a channel from Cow Creek, a tributary of the Sacramento River below Shasta Dam, to Dry Creek, a tributary that now flows into Shasta Lake,” said Sisk, who is currently running for the California Assembly in Assembly District 1. One major problem is that the federal government won’t let the Winnemem participate in the meetings where fish passage and restoration plans are discussed, since over three decades ago their federally recognized status was taken away from them by means of a clerical error. More recently, Bureau Officials said the fish passage project has been suspended. “They won’t let us on the committee for the restoration pilot project. They said it would take an act of Congress for us to get on the committee, even though the Tribe joined a 2009 lawsuit pushing for the restoration of the run,” she said. Meanwhile, the U.S Bureau of Reclamation continues to move forward with its plan to raise Shasta Dam. Over the next several months, Bureau of Reclamation geologists will be extracting core samples from on, around and deep within Shasta Dam. Gathered data will be used to characterize concrete and geology conditions related to a proposed 18-½ feet Shasta Dam raise, according to Todd Plain, Bureau of Reclamation spokesman. The federal government has been studying the idea of raising the dam and enlarging Shasta Reservoir on and off since the 1980s. The Tribe held a “war dance” in 2004 and again in 2014 at the Shasta Dam opposing the raise. “The current Shasta Dam and Reservoir Enlargement Project envisions raising the existing dam by 18 ½ feet, providing an additional 630,000 acre-feet of stored water for the environment and for water users,” according to Todd Plain of the U.S. Bureau of Reclamation. “Enlarging the reservoir will improve water supply reliability for agricultural, municipal and industrial, and environmental uses; reduce ﬂood damage; and improve water temperatures and water quality in the Sacramento River below the dam for anadromous ﬁsh survival. Chief Sisk strongly disagree that the raise will help anadromous fish survival and improve water temperatures and water quality. “This is the most idiotic waste of millions of dollars since the 1980’s with another billion dollars or more on a very old DAM. Will the BOR’s drilling make people in Shasta County aware of how much toxic sediments exist in the bottom, will it show how big the water cave waves are that might not hold the new tonnage of an 18.5-foot raise?” asked Sisk. The raising of the dam would not only threaten salmon and steelhead runs, but it will inundate many of the Tribe’s remaining sacred sites that weren’t already flooded when Shasta Dam was built, according to Sisk. She views the dam raise as part of bigger plan to export more Northern California water to corporate agribusiness and Southern California water agencies in conjunction with the proposed building of Sites Reservoir and the Delta Tunnels. ”Whatever happens to the salmon, happens to us,” Chief Sisk summed up. Big thanks go to James Netzel of Tight Lines Guide Service, who is now guiding for fall salmon in the metropolitan area, and Alyx and Brennen Howell for donating their time to the Run4 Salmon.